UI-related template looks like a non-editable area for rendering plain text or a single data record. Its content is set with the help of the same-name template parameter. 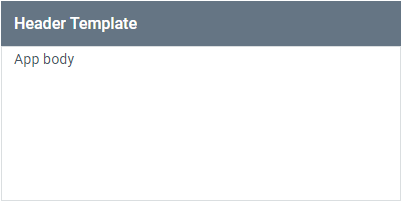 template: "Default template with some text inside"
Specifying the view type as "template" is optional. The following code works as well. template - (string/function) the template of a widget. content - (id|HTMLElement) the id or node, the content of which will be moved to the view. height - (number) sets the height of the scrollview. width - (number) sets the width of a widget. autoheight - (boolean) lets the component autosize to its contents. false - disables both scrolls. As a result, contents from HTML are placed inside the view. The same-name property of the component, template, is also used by Webix data components. It allows setting pattern to display texts and render data items from multiple datasets alongside with adding styling to them. The Data Templates article covers all the rules of templating. The rules of data templating can be studied in detail in the dedicated documentation article. a template-specific setContent method that can set the contents of an existing HTML node as template value. The default template is a white non-editable area with some text or HTML content. It's surrounded by a gray border. The clean template looks very much like the default one, but has no borders and no paddings. Header template is used to set headers for layout rows/columns. Looks like a blue bar above the main contents. Note that headers of accordionitems are set in a different way. Section template places header within the line, thus making it possible to neatly divide the web page into blocks. As there's a line in this template type, it would be nice to resort to borderless layout design.